All components can be powder coated to match to the roof or optional 2 inch metal color strips can slide into the face for an instant color match. ColorStrips are available for purchase or the installer can simply use metal from the actual project roofing supplier. 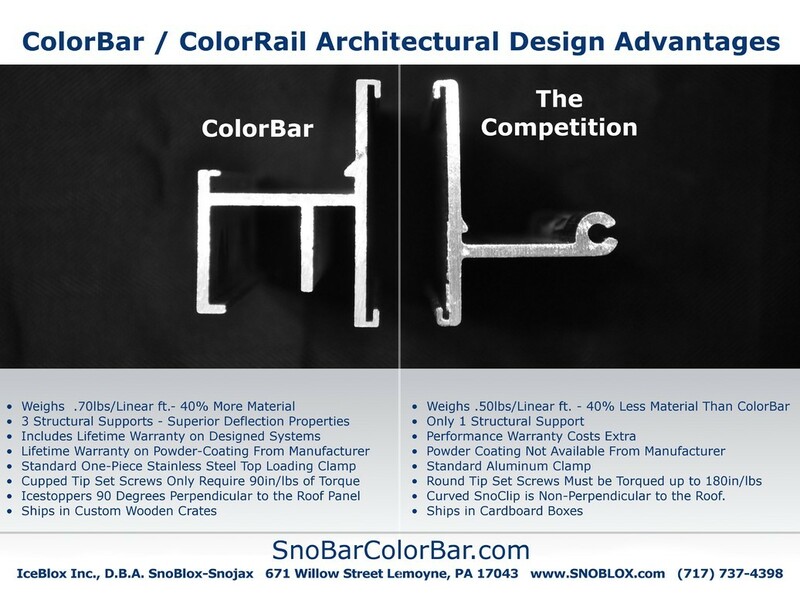 The ColorBar snow retention systems uses the same patented, one piece, “Stainless Steel Seam Clamp" as the SnoBar and it mounts directly onto the seam without panel feeding. SnoBar clamps allow the bar to be top loaded, saving time and money by installing fast without damaging the bar. When comparing this particular bar to the competition, take a look at the side profile. When directly compared it is clearly evident why we feel this product is "Bar None" to any system of its type on the market! This is a downloadable .pdf that shows the standard colors for the optional ColorStrips.